As you know I generally have a soft spot for anything flowing and cool-colored, so I wanted to do a generic Queen of the Seas costume this month. If you were wearing this to a party with no particularly picky mythology or history geeks in attendance, you could perhaps call yourself the Queen of Atlantis, but I can’t just go blithely saying something like that somehow. Lindsey commented on my blue and gold princess gown and said that she’d seen a similar one on Zwinky, but I can’t check it out because I use a Mac; can someone take a screenshot of it and send it to me, please? Prismacolors used: Cool Grey 30%, 70%, 90%, Black, White, Indigo Blue, Denim Blue, Light Cerulean Blue, Sky Blue Light, Marine Green, Jade Green, Tuscan Red, Poppy Red, Pale Vermillion; Verithin Black and Cool Grey 70%; Sakura Soufflé White. Question!!! Do you get your prisma colours in sets or do you get them seprately? and are there specific colour sets like a set of “French Grey” or “Tuscany Red”? Wow, Liana, you too? *laugh* I’ve almost got enough money to get myself a half-off set! Wow. This dress is so gorgeous! I wish it was a real dress, because I’d so wear it during a costume party. I love the sea-foam effect along the hem. OMG!! I love this dress! Your sea inspired dresses are always so beautiful! I’ve been thinking about this dress all night, and I’ve realized that it’s gonna help me. Quite a while ago I got this beautiful caribbean sea blue fabric, no idea what to do with it, but too pretty to pass up and I have a 50% off coupon. 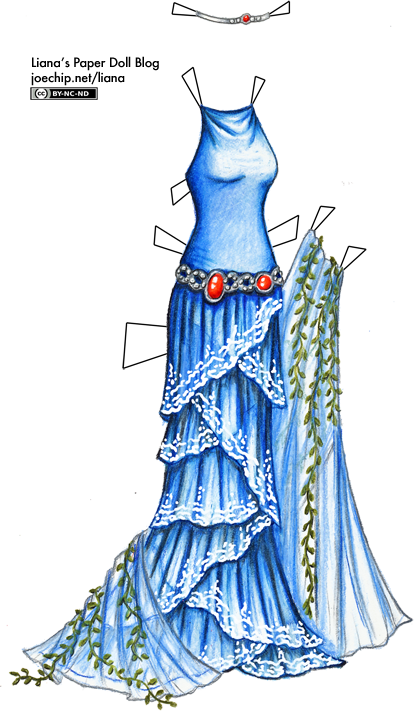 I had the vague idea of making a dress with white lace as sea-foam to the fabric’s sea blue, but couldn’t figure out the right style/pattern. Thank you Liana, for giving me the right pattern idea! I love it! Especially the seaweed that decorates it. I was just thinking, but if there’s a good queen of the seas…does that mean that there’s a bad one? I think that this dress would look good in gold as well….. beautiful!!! i love the detail. the red gems look fabuless. i would love to see a mermaid tail tutorial… after haloween? I really love this one. Just everything about it. this is just stunning. I wish you’d do more mermaid-themed outfits more often.